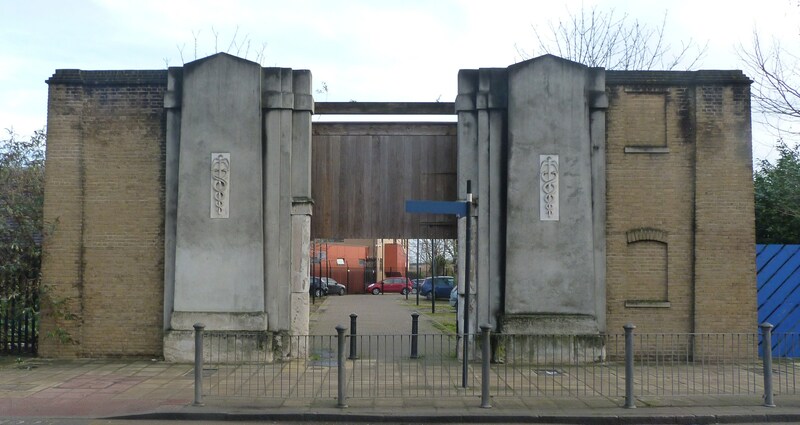 Deptford was first recorded in 1293 as Depeford, meaning deep ford (across the River Ravensbourne, a tributary of the Thames). The ford, and the trackway leading to and from it, had almost certainly been in existence in the pre-Roman period, and became incorporated into Watling Street in the Roman. By Medieval times, a small village had sprung up here, on what had by then become part of the pilgrimage route from London to Canterbury, and it was referred to in Geoffrey Chaucer’s “Canterbury Tales”, written in 1400. The Battle of Deptford Bridge was fought here in 1497. In later post-Medieval times, the former village grew into a sizeable town, with strong and lasting links to the Royal Navy, and to maritime trade (including the iniquitous slave trade). One of the Royal Naval Dockyards was built here in 1513, Trinity House in 1514 (the first master being Captain Thomas Spert of the “Mary Rose”), and the East India Company Yard in 1607. 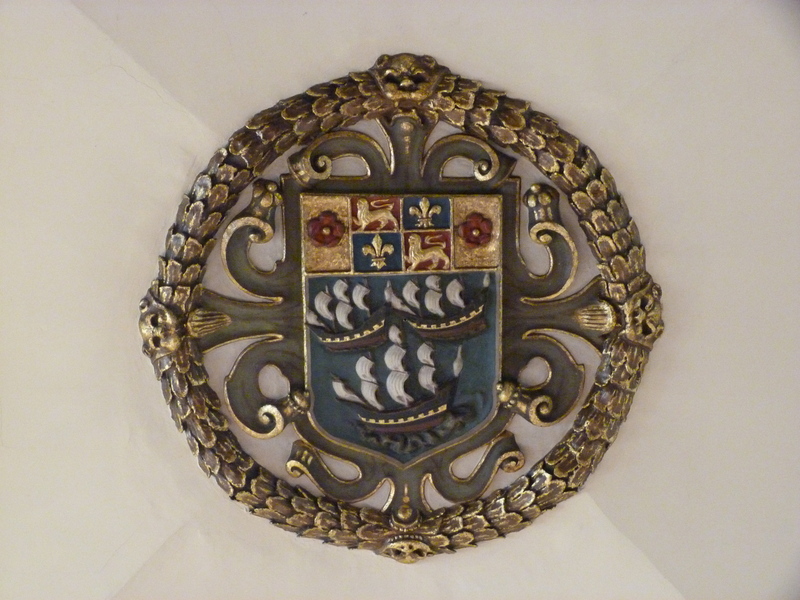 In 1549, a mock naval battle was staged here for the entertainment of Edward VI; in 1581, Elizabeth I knighted Francis Drake here aboard his ship the “Golden Hind(e)”, recently returned from its successful circumnavigation of the globe; and in 1698 the Russian Czar Peter the Great stayed in John Evelyn’s house here in order to study the shipyards. 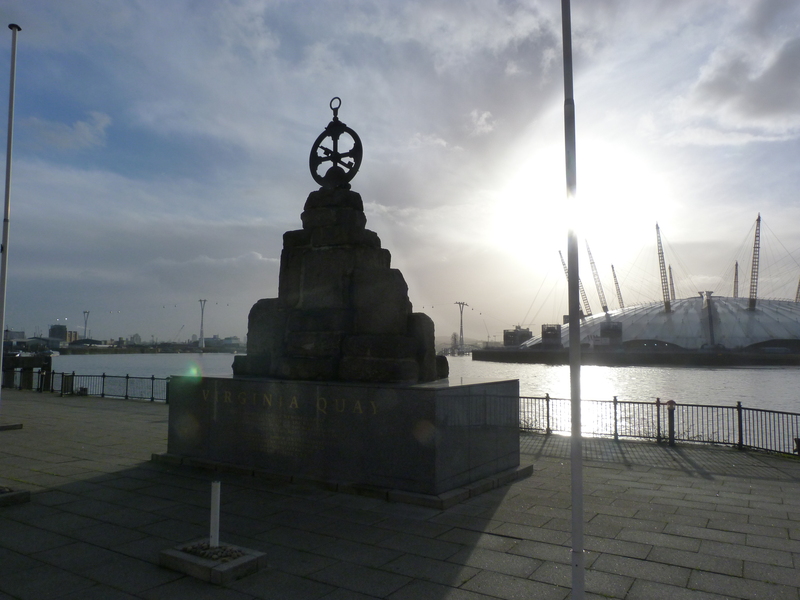 The area’s comparative prosperity began to decline in the eighteenth century, after the seventeenth-century rebuilding of Chatham Dockyard, which was more accessible to ocean-going shipping, being situated in the Thames estuary, some twenty-five miles further downriver. The decline continued into the nineteenth century, as evidenced by William Booth’s “Poverty Maps”, and was accelerated by the bombing of the Blitz of the Second World War in the twentieth, but is now in the process of being reversed by regeneration. Deptford was historically part of the county of Kent, but since 1965 has been officially part of Greater London. The church of St Nicholas was originally built at least as long ago as the twelfth century, and subsequently rebuilt in the fourteenth or fifteenth century and again, partly through the benefaction of the East India Company, in the late seventeenth, around 1697, only to be badly damaged in the Blitz of the twentieth. The fourteenth- or fifteenth- century tower still stands. The poet and playwright Christopher Marlowe – he of the “mighty line” – is buried in the churchyard, having been murdered in a nearby tavern in 1593. 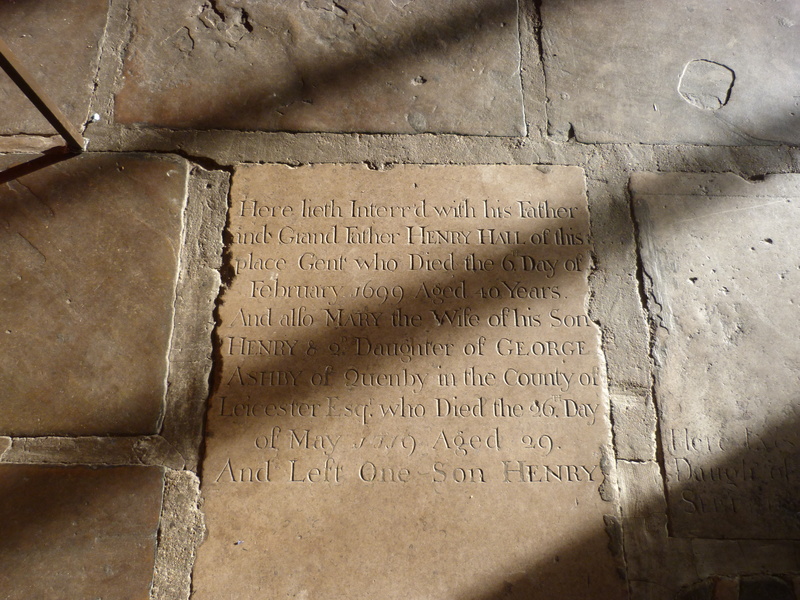 There are also a number of surviving post-Medieval memorials in the interior, including those to Sir Richard Browne of Sayers Court (d. 1604), who was John Evelyn’s father-in-law, and to other members of both Browne’s and Evelyn’s families; and to Jonas Shish (d. 1680) and his sons Michael (d. 1685) and John (d. 1686), all of them Master Shipwrights. And a late seventeenth-century carved wooden panel of “Ezekiel in the Valley of the Dry Bones” that has been attributed to Grinling Gibbons, who is known to have once lived and worked nearby. Nicholas is the patron saint not only of children but also of mariners and fishermen (and of those wrongly condemned). This entry was posted in Far flung London, Georgian London, London churches of note outside the City of London, London History, Maritime London, Medieval, Post-Medieval, Victorian London, World War 2 and tagged Christopher Marlowe, Czar Peter the Great, Deptford, East India Company, Edward VI, Elizabeth I, John Evelyn, Royal Naval Dockyards, St Nicholas Deptford, William Booth on September 10, 2016 by Bob Jones - The Lost City of London. Blackwall was first recorded in 1377. It takes its name from the Old English “blaec”, meaning black, and “wall”, in reference to an artificial embankment put up here to hold back the waters of the Thames. The Citizen and Cordwainer Captain John Smith (1580-1631) set sail aboard the Susan Constant from Blackwall in 1606 to establish the first English colony in the Americas, at Jamestown in Virginia, “from which began the overseas expansion of the English-speaking peoples”. 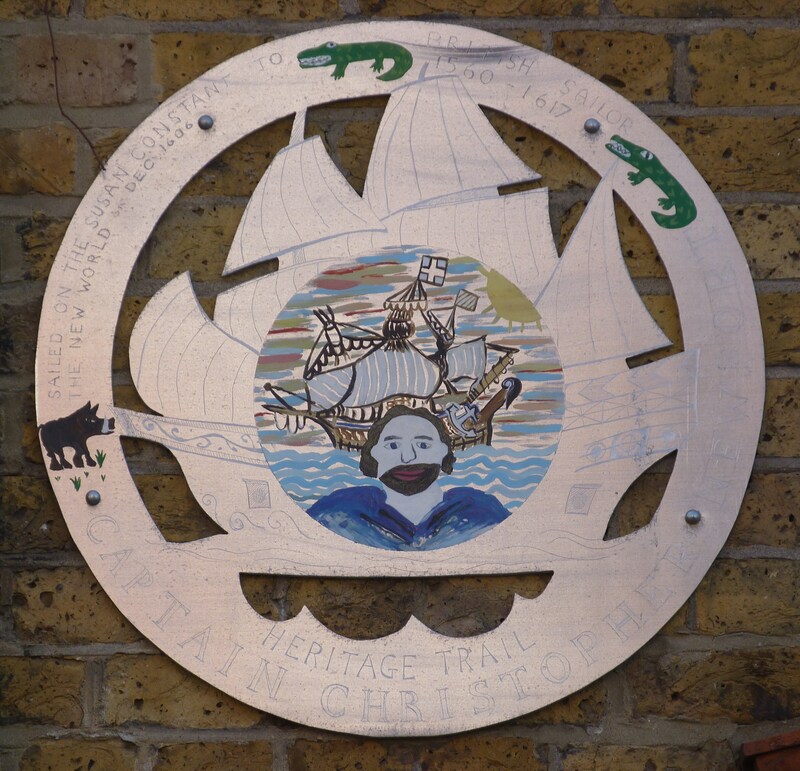 There is a memorial to the Virginia Settlers on Virginia Quay in Blackwall, and a plaque to Captain Christopher Newport, who commanded the Susan Constant, Godspeed and Discovery, on Limehouse Causeway in nearby Limehouse, where he was born in 1560/1. 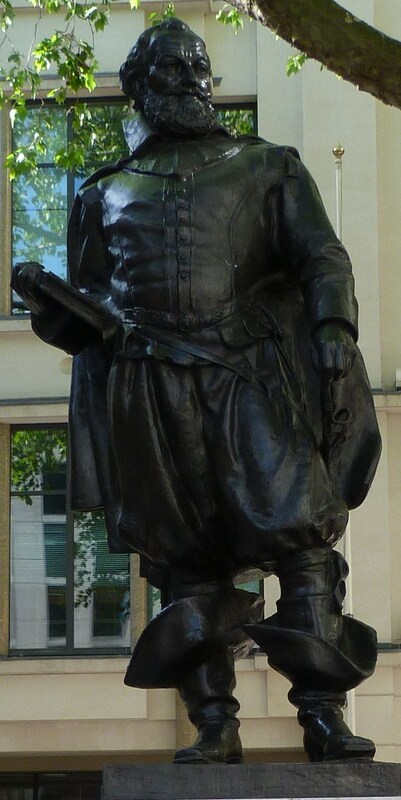 John Smith is commemorated by a statue in the churchyard of St Mary-le-Bow on Cheapside in the City of London, and by a stained glass window in the church of St Sepulchre on Newgate Street, where he was buried in 1633. 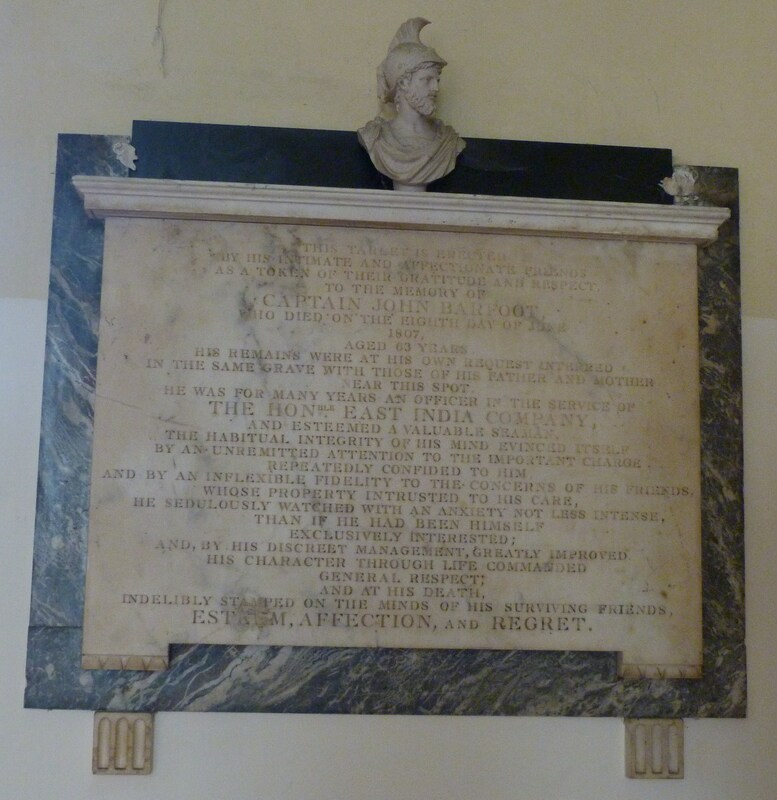 Incidentally, the Algonquin Princess Pocahontas, who famously saved Smith’s life in the Americas, later visited London, staying at the Bell Savage on Ludgate Hill, and died at Gravesend on her way home. 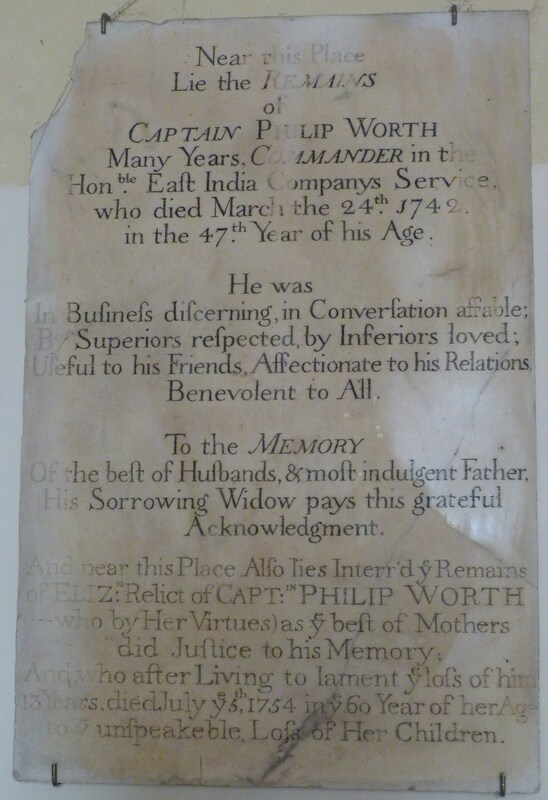 The East India Company established a shipyard and docks in Blackwall in 1614. 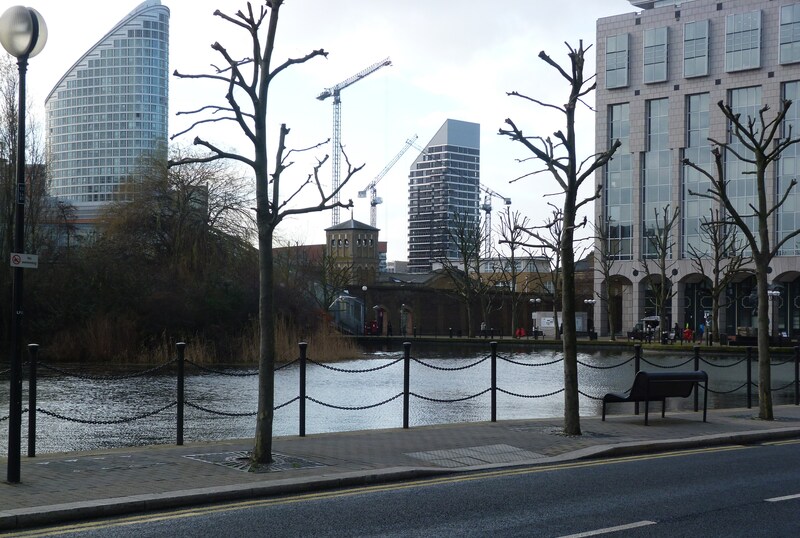 The docks came to be owned by the East India Dock Company, which considerably extended them in the nineteenth century; and in turn by the Port of London Authority, in the twentieth. They have been disused for nearly fifty years now, although some interesting structures still survive. 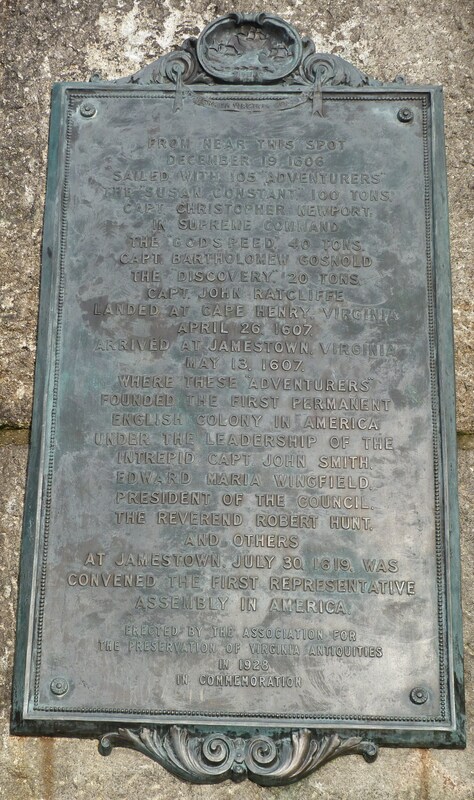 This entry was posted in 17th Century London, Far flung London, London History, Maritime London, River Thames and tagged Christopher Newport, East India Company, John Smith, Pocahontas on January 16, 2014 by Bob Jones - The Lost City of London. Poplar was first recorded, as Popler, in 1327. It takes its name from the poplar tree, in reference to such once having abounded in the marshy ground hereabouts. It was probably first settled in the Medieval period, although still only sparsely populated in the post-Medieval, leastwise before the Great Fire of 1666. In Tudor times, Sir Thomas Spert and 54 mariners lodged here while sails were made for Henry VIII’s great ship “Henri Grace a Dieu” (which later saw action against the French at the Battle of the Solent, in which the “Mary Rose” sank; and later still transported the king to the peace summit with the French at the Field of the Cloth of Gold). 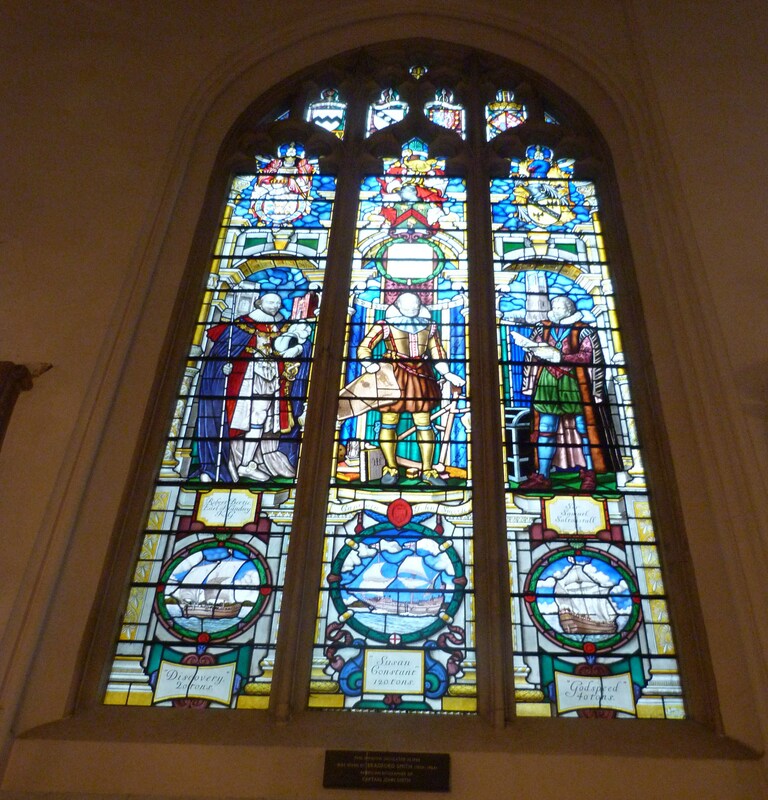 In succeeding Stuart times, the (Honourable) East India Company built a chapel here for its workers in nearby Blackwall. 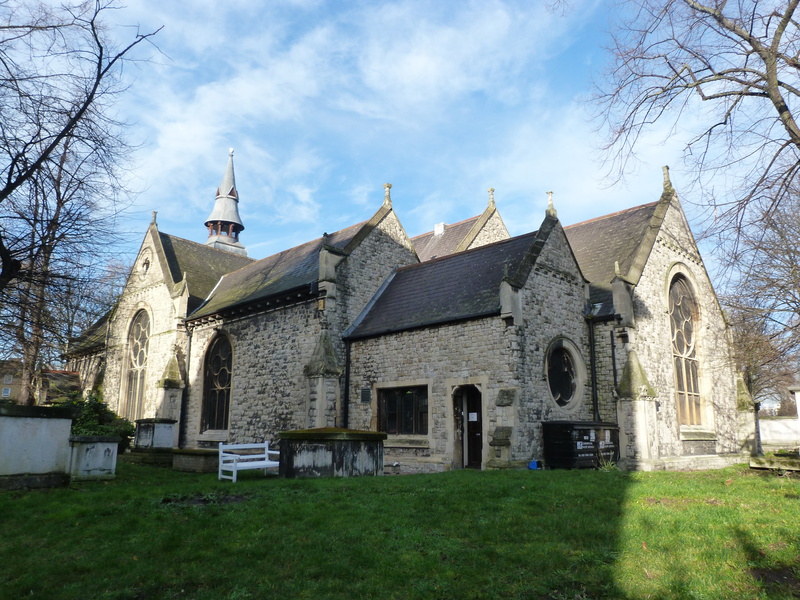 Actually, although building work on the chapel commenced in 1642, during the Civil War, it was not completed until 1654, during the inter-regnum between the execution of Charles I in 1649 and the restoration of Charles II in 1660. (It is the only place of worship in London to date to this turbulent time, and indeed one of only a very few in the entire country). Its design was originally “severely rectangular”, and as such ideally suited to the form of worship practised by the Puritans, which emphasised the importance of the word over that of the ceremony. 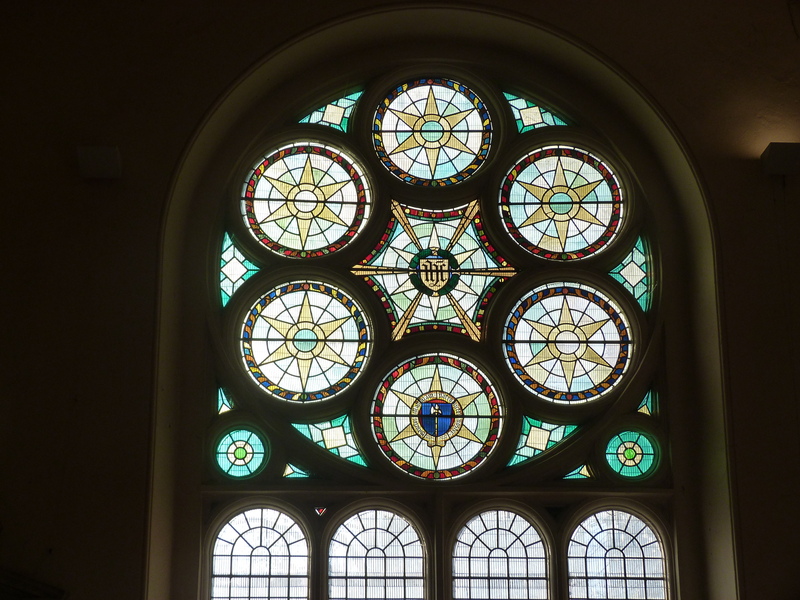 The chapel became a parish church, dedicated to St Matthias, when the East India Company dissolved in the 1870s, and the church in turn became a community centre in the 1990s – see link to website below. The exterior of the building was rebuilt, by William Milford Teulon, younger brother of the more famous Samuel Sanders Teulon, in the late nineteenth century, although, remarkably, the interior remains to this day essentially as it was in the mid-seventeenth. General view of the seventeenth-century and later interior. 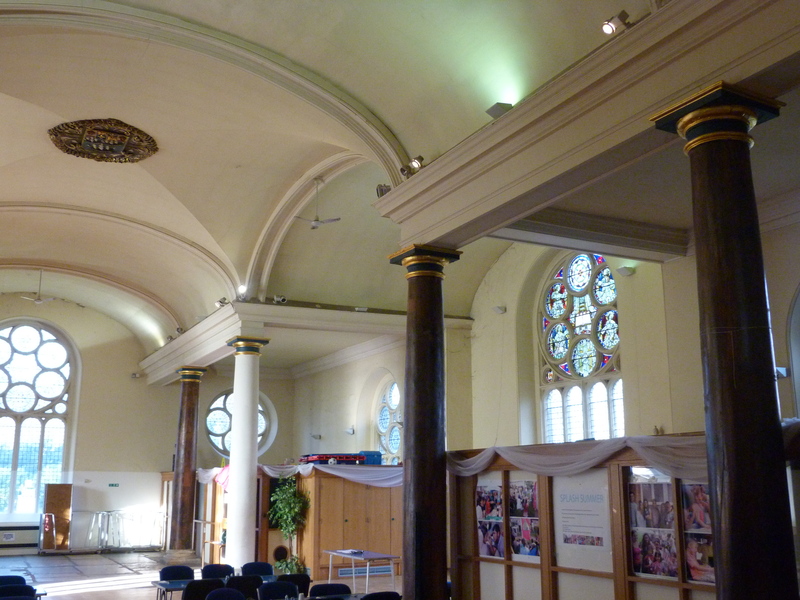 Note the Tuscan columns and elliptically-vaulted ceiling. This entry was posted in 17th Century London, Far flung London, History of Architecture, London History, Maritime London and tagged East India Company, William Milford Teulon on January 14, 2014 by Bob Jones - The Lost City of London.